This was the 4th broadcast of Shawa Gohan. Sawako was wearing a pink cardigan, buttoned at the top, over a white (or light green) one piece. Her hair was in a ponytail. Sawako read some mails in the studio. Someone asked whether she likes red or white miso. Sawako said she didn't like either by themselves, and prefers awase miso. After around 10 minutes they switched to the outdoor video. Sawako was in Okachimachi, which was one station away from Akihabara. But instead of walking toward Akihabara, she walked in the other direction toward Ueno, though the Ameyoko area. 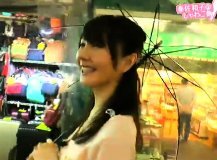 It was raining, so Sawako was holding a clear umbrella. Sawako said this was the first time she walked throught Ameyoko. She stopped at a store and bought a pineapple smoothie. Sawako also went to a fruits store, and bought a red apple. She said she will eat it for breakfast the next day. The restaurant that Sawako went to was Pizza Bar Ura Akihabara. It was an Italian restaurant, not just pizza. Sawako ordered one pizza, and a few other dishes. The margherita pizza came, and it was cut into four pieces. Sawako ate one piece. She said she likes mozzerella cheese. It took Sawako less than two minutes to eat her piece of the pizza. Then the shrimp in raclette cheese dish came. Sawako said she likes raclette cheese, and explained what it was. She read a book called "Cheeses of the World" when she was in high school, so she knows a lot about cheeses. Then Sawako ordered three more dishes. Around the 28 minute mark, they switched back to the studio. Sawako said she wanted to go to Shinbashi, so she tried to get a 4. But she rolled a 3. So the next station was Yuurakuchou. Sawako said she wanted to try Chinese or Asian food next time. The members only video was around 11 minutes. This video was just a continuation of the restaurant video. Sawako just ate the other stuff that she ordered.